The Damodar Valley lies in the Chota Nagpur Plateau of the state of Jharkhand, India. It also extends to some parts of the state of West Bengal. 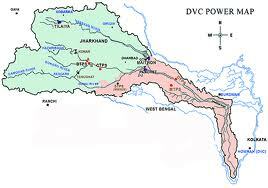 The Damodar Valley is one of the most industrialised parts of India. Three integrated steel plants (Bokaro, Burnpur and Durgapur) of Steel Authority of India Limited (SAIL) and other factories are located in the valley.The Damodar Valley contains large reserves of coal and mica, and the area is a highly developed industrial belt. Many refer to the Damodar Valley as the Ruhr of India because of its similarities with the Ruhr mining-industrial area of Germany. 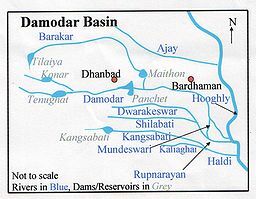 The dams on the Damodar River have several hydroelectric power plants. Of late, the Damodar has become one of the most polluted rivers of India, with chemicals, mine rejects and toxic effluents flowing into the river from mines and industries located in the valley.The largest (almost the only) reserves of coking coal in the country are found in the Jharia coalfields in the valley. The valley also generates 60% of India’s medium grade coal. Coal India Limited operates in the valley in a big way. Several dams have been constructed in the valley, for the generation of hydroelectric power. In order to broad-base and infuse professionalism in the working of Damodar Valley Croporation (DVC), the Union Cabinet on Thursday gave its nod for the introduction of the Damodar Valley Croporation (Amendment) Bill, 2011, in Parliament. The Bill seeks reconstitution of the corporation with four full-time members, namely chairman, member (technical), member (finance) and member secretary, and six part-time members. According to the Cabinet’s decision, now the chairman will be the CEO of the corporation while the posts of financial adviser and secretary have been abolished.